Ban Hua Thung Be famuse Herbal name, Rumors of economic news, The way of life to create, harmonious, Generous to development. The motto is a reflection of the community with 150 houses and a total population of 454 people. The variety of vegetation is also outstanding along with the local way of life. It has managed interlaced. The ability to create value through sustainable livelihood of the locals. Including community forest conservation. The establishment of a herbal learning group. Vetiver grass planting project to conserve upstream forest of headwaters. The biogas project Coffee Planting Project and the most prominent is the Bamboo Economy Project. This became a unique local product of the village. It is a model village to grow bamboo by villagers to care for. And it is a study area for both public and private organizations, both locally and internationally. Travel Ban Hua Thung is located at 14, Chiang Dao Sub-district, Chiang Dao district. If you drive out of town. 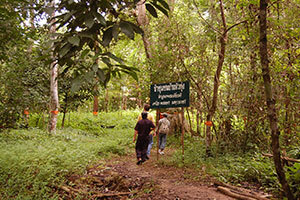 Access to the intersection of the bypass road through the village of Thung La-korn to a few kilometers. It will be found on the headland of Ban Thung Thong on the plains. The line of the Wildlife Doi Chiang Dao. The watershed area of Mae Luang. And the stream flows into the Ping River. West is bordered by large forests. Called "forest community of Ban Hua Tung" In addition to the abundance of nature. Every area in the community can see the beautiful Doi Chiang Dao and Doi Nang clearly.